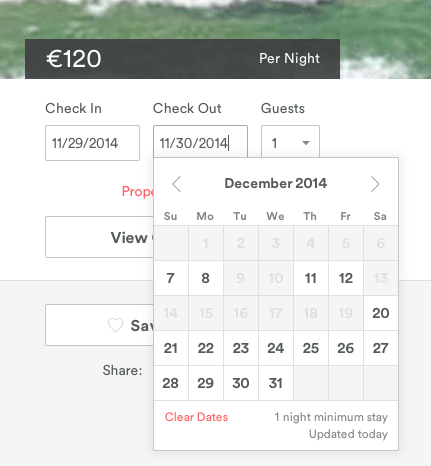 iCal calendar for airBNB, 9flats, HomeAway etc. Social lodging service sites such as airbnb, 9flats or HomeAway are becoming more and more important expecially for owners of holiday apartments. They allow you to advertise very cost-effectively and receive plenty of bookings from guests. However you'll also have to update your vacancies on those sites and block the dates on which your apartments are already occupied. Especially when you have a lot of bookings and multiple apartments - or want to be present on not just one but a number of those websites - this can be a considerable and time consuming effort! Lodgit Desk's additional online modules can take this work out of your hands. This is how it works: Lodgit's optional module "Online Systems" generates a so called ICS feed for each of your rental units. That is an iCal calendar in which the information about occupied and vacant dates are stored. No other data apart from that is passed on! 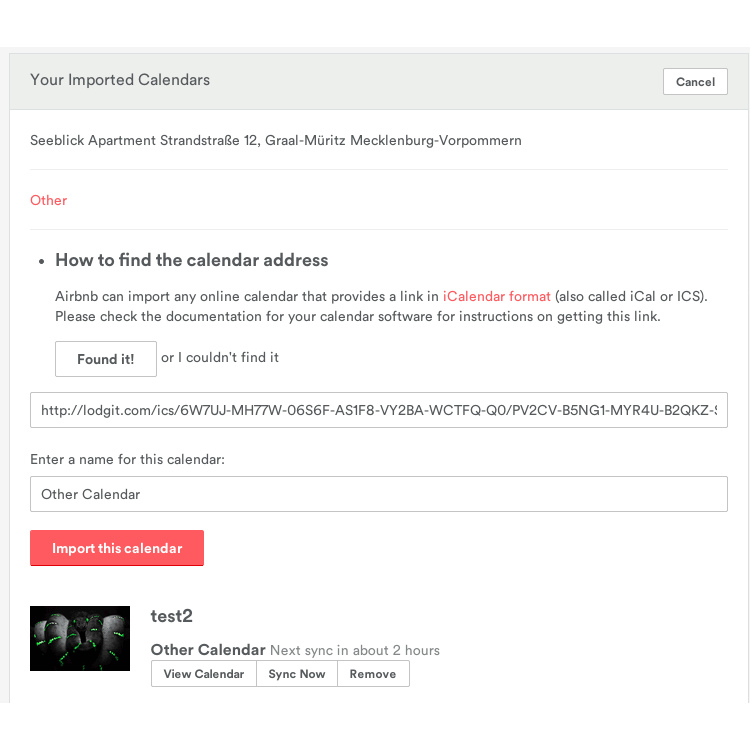 You can make your listings on airBNB, 9flats, wimdu, HomeAway, VacationRentals.com and similar portals access this calendar provided by the ICS feed and have the vacancies of your listings updated automatically according to the bookings you have in your Lodgit Desk reservation schedule. This means that you'll no longer have to update your vacancies on each and every one of those websites manually. So when you receive a booking all you have to do is enter it in Lodgit Desk. Then the respective timeframe will automatically be marked as "occupied" on all the websited accessing the ICS feed. 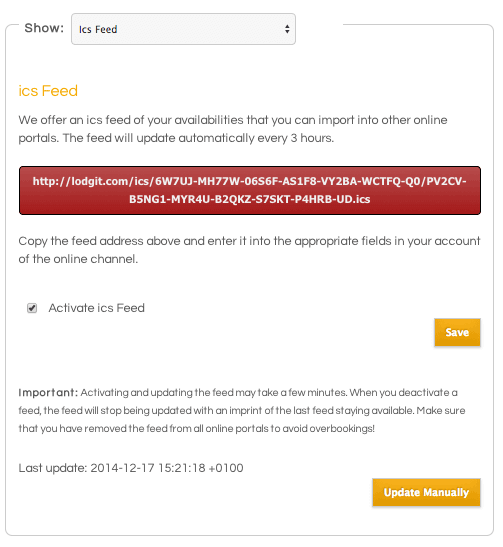 Please note: The ICS feeds provides merely a one-way interface. When you receive a booking through one of the aforementioned or other websites it will not be imported into Lodgit Desk automatically but you will still have to enter it yourself. However the time consuming job of having to block the respective timeframe on every portal you're listed on individually will no longer be necessary! The ICS feed currently is a part of our additional "Online Modules" which can easily be added to your existing Lodgit license for a monthly fee of 1,50 € per rental unit in our Online-Shop.